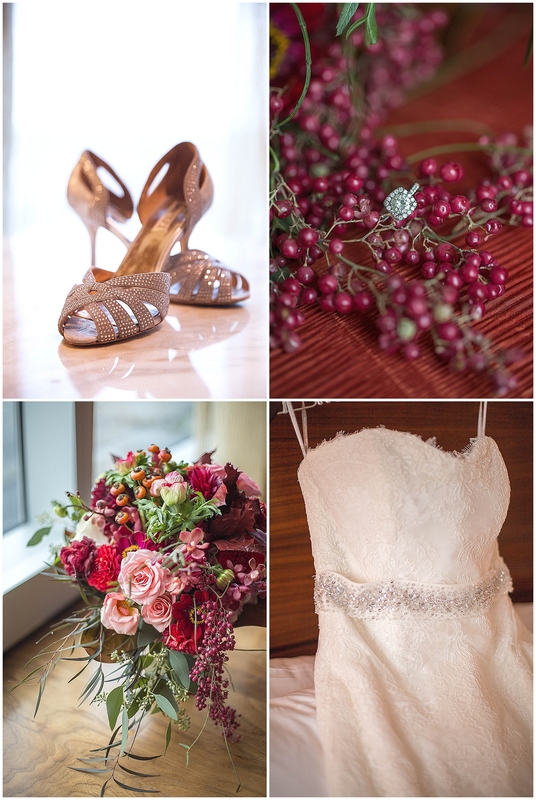 Mon Amie Events, Inc has had the honor of creating weddings for many years with families from the start of the wedding planning process through the wedding weekend. We’ve gone to site inspections, dress fittings, chosen invitations, designed spectacular celebrations and tasted many flavors of cake over the years. It’s been a delightful and delicious process, but we understand not every couple needs full wedding planning services. It’s what we do, it’s where we excel. We know though, some couples thrive off of setting each of the meetings with their professionals, have the time to dedicate to these tasks, the experience to negotiate contracts and the ability to design their own weddings. However, they may want assistance on their wedding day so they can truly enjoy the weekend with their friends and family. They should be able to do this. Every bride and groom should have someone on the wedding day to cater to their needs and ensure the details are in place and taken care of. Here’s where we knew something was missing. 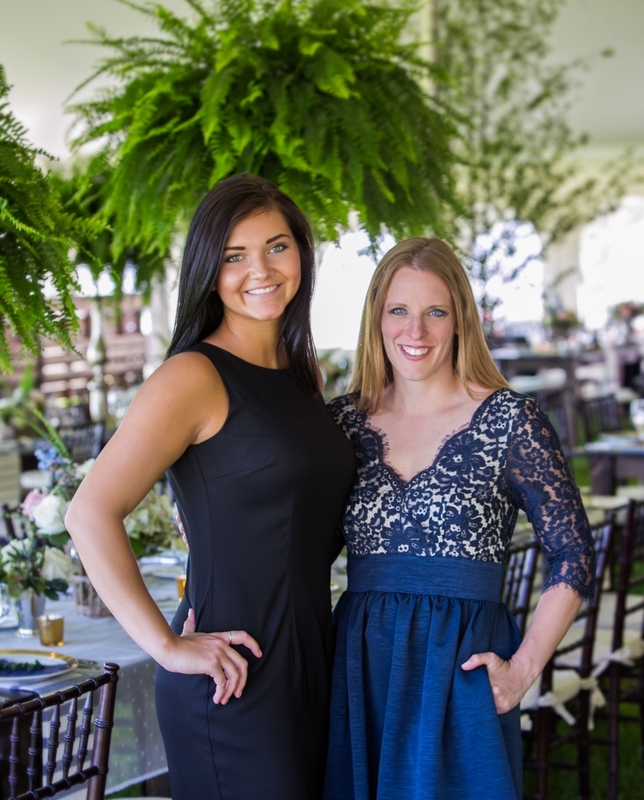 Mallori has worked with Mon Amie Events, Inc for several years and knows our company philosophy and training. She knows the area’s professionals and will serve as a liaison to couples in the final weeks before their wedding day ensuring every detail is exactly as they’ve envisioned. Please visit www.LeJourDuMariage.com to learn more about Mallori and how our sister company may be of service. To celebrate our sister company’s birthday, Mon Amie Events, Inc. is also debuting our new logo and website. 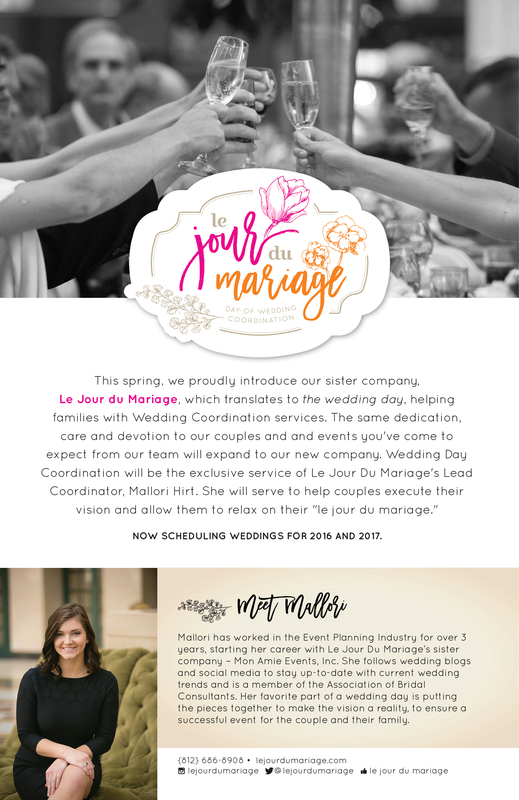 Mon Amie Event Inc’s new logo pairing with the announcement of our sister company, Le Jour du Mariage, show our commitment to helping couples create stylish, sophisticated, cosmopolitan yet approachable weddings. Between our two companies, we’ll cover their requirement for full service execution or their request of a day of coordinator. 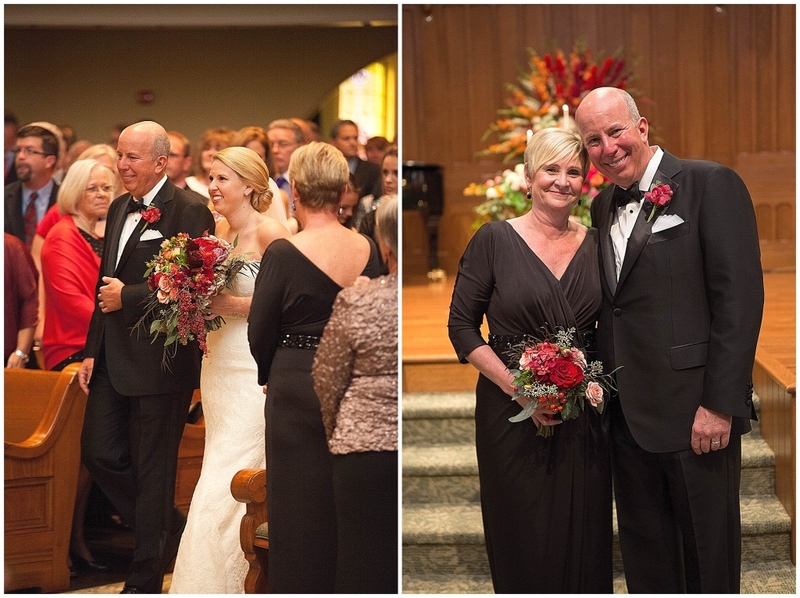 We are here to service families to ensure they have the wedding day of their dreams. We hope you are enjoying the new look; let us know what you think! Few people can say they met their future spouse at Indiana University’s Little 500 week long festivities. I can say that. Add Grace and Graham to the list. The minute I met them and they told me that, I knew we were destined to work together on their upscale Hoosier Homecoming wedding celebration! Our similarities didn’t stop there! Grace’s mom, Debbie, and I share a birthday – what’s not to love about us Leos right 😉 , as a child Grace worked as a youth interpreter at Conner Prairie *(if you know me outside the event world, you know I adore those kids from 1836!) 😉 and Grace and Graham wanted to infuse a bit of IU Hoosier Hospitality into their wedding day. This bride was meant to be mine! 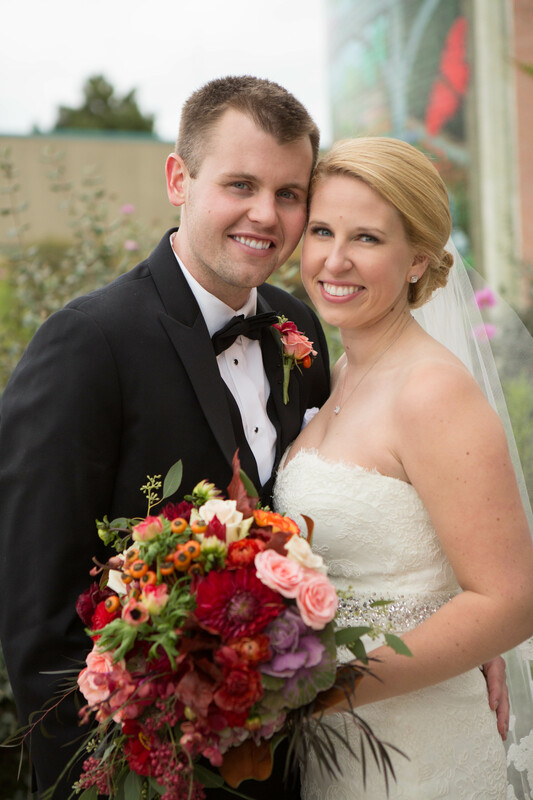 Ensuring the wedding held the upscale, formal feeling their parents wanted, but give the whimsical, fresh and youthful touch this alumni couple deserved, needed a creative touch and constant level of mediation. On her wedding day, Grace gave me the sweetest note, including the sentiment that she and her mom would not still be best friends if it weren’t for me keeping things in check during the planning process. Grace, I’d do anything for you two – I really, really love your family! 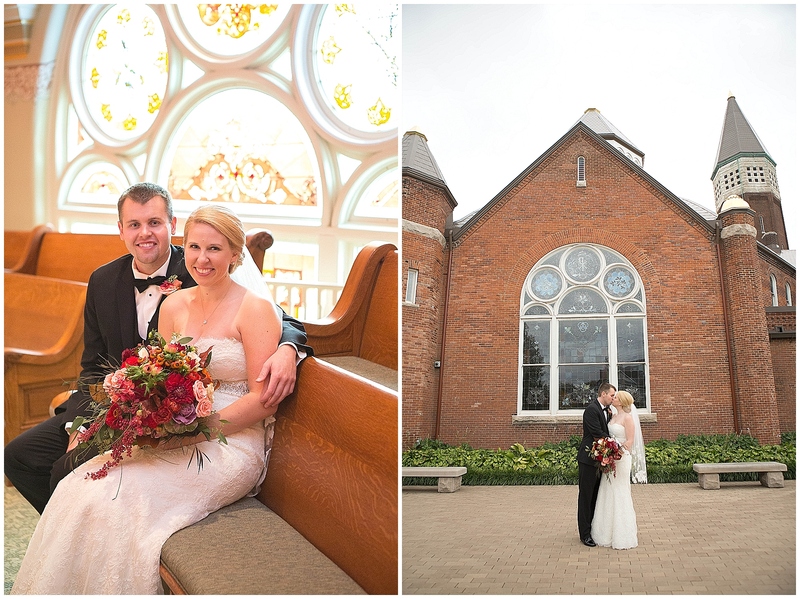 Grace and Graham selected the stately Indiana Landmarks Center for the ceremony and the grand JW Marriott for the reception celebration. 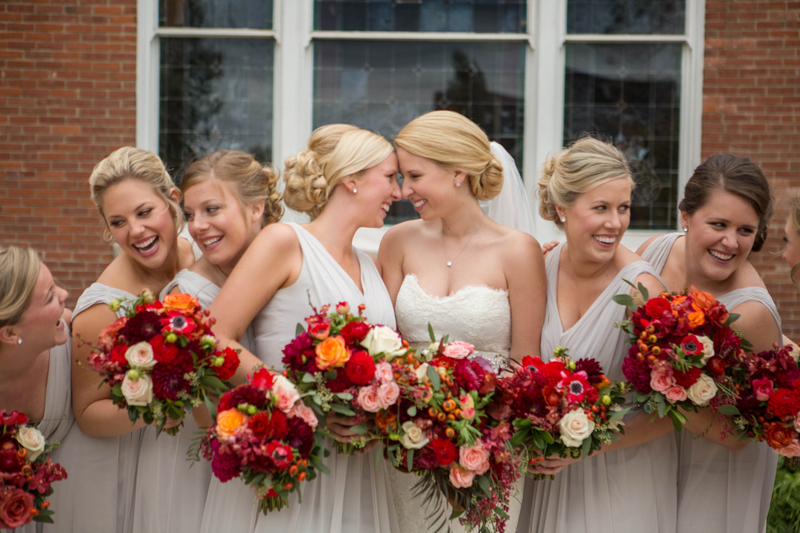 The juxtaposition between these two locations allowed for this warm fall palette to shine beautifully. 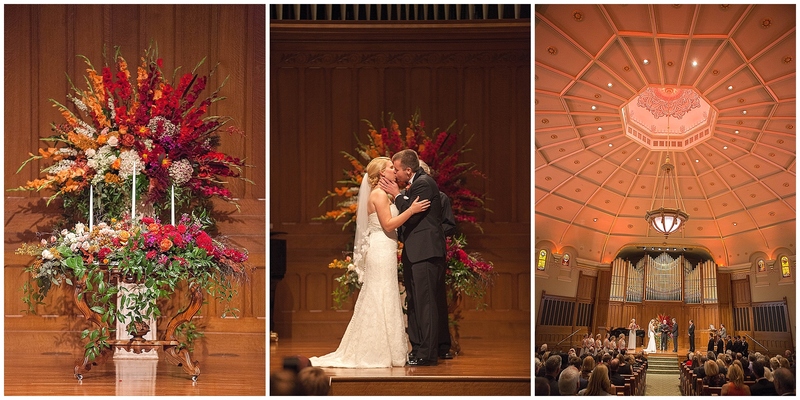 The Landmarks Center has a warm autumnal feeling, and Grace and Graham’s wedding seemed to be written for this space perfectly. The day started in the JW’s presidential suite. Grace and “her Goddesses” – as they were nicknamed at some point during the day (because of their stunning Grecian inspired gowns) got ready. Grace, you are your namesake! Elegant, calm, kind, thoughtful – and so are all of your friends. It was delightful to witness your bridal party all day. 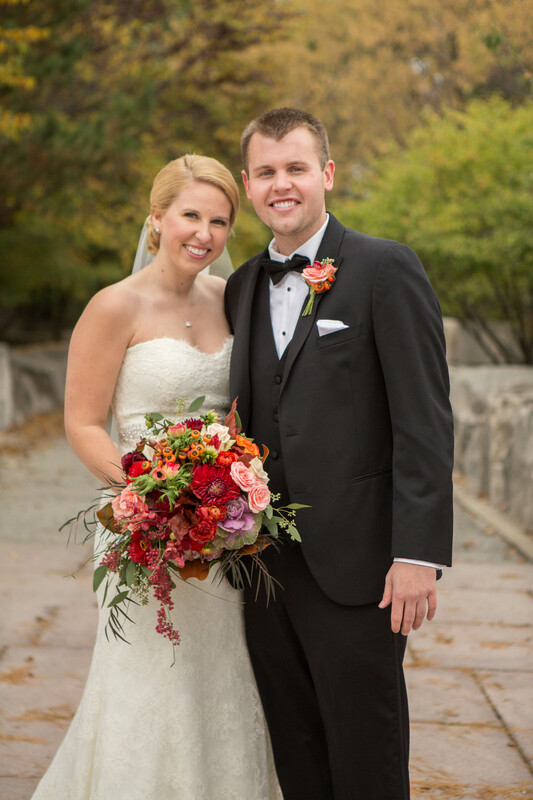 The first hint of the wedding’s Indiana University infusion was actually in the guests’ welcome bags – a crimson pashmina wrap for the chilly October weekend. The second Grace and Graham’s big request – “the cups.” Anyone who attends IU knows of the cups that every bar and a certain (delicious!!) breadstiX location has and their famous shaped cup. Grace included these cups on the bar once the late night snack emerged. 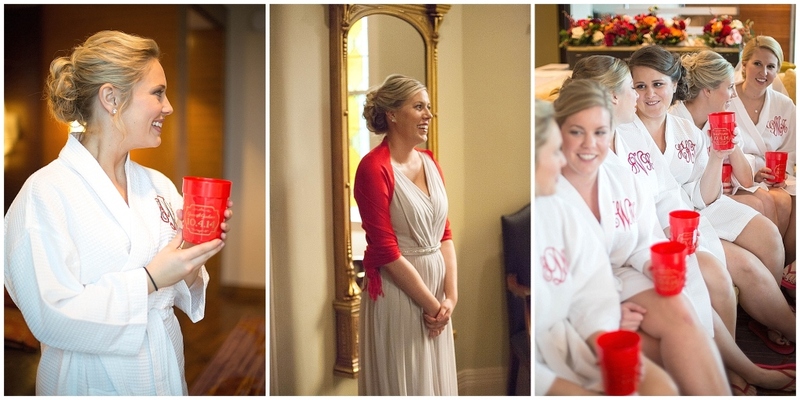 However, the bridal party was given a sneak preview to them while they got ready – in IU Red of course! 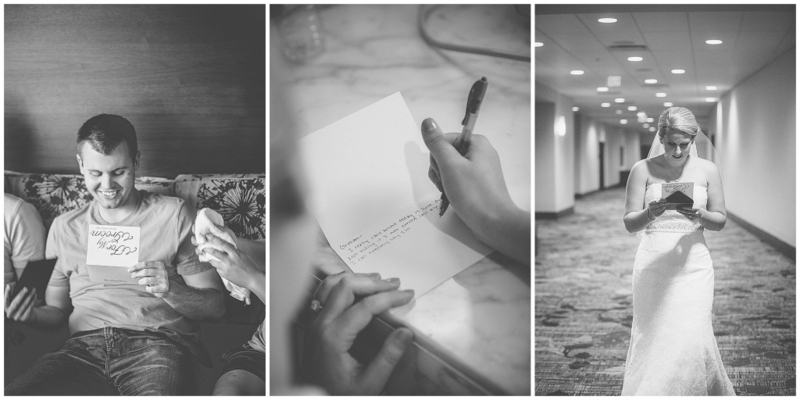 Grace and Graham spent the morning writing letters to one another. I love when couples do this, they are always so emotional, heartfelt and real. Grace then spent time with her girls and dressed in her beautiful shoes and elegant Monique Lhuillier gown. The details of this gown perfectly matched her skin tone, hair and stunning engagement ring. 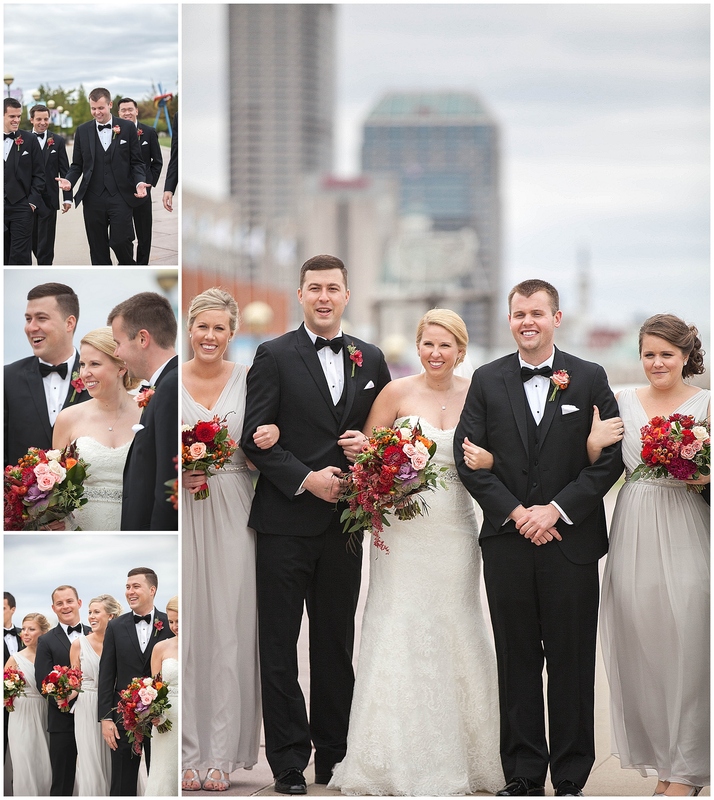 The bridal party was then ready to depart for an afternoon around the Circle City for photographs. They joyfully spent the day taking pictures, sharing stories and catching up. 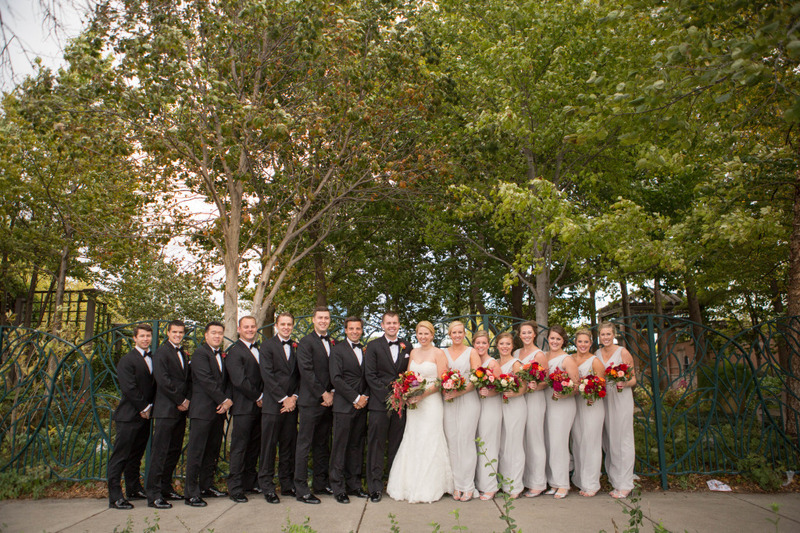 It had been just over a year since graduation, so Grace and Graham’s wedding was truly a Hoosier Homecoming! 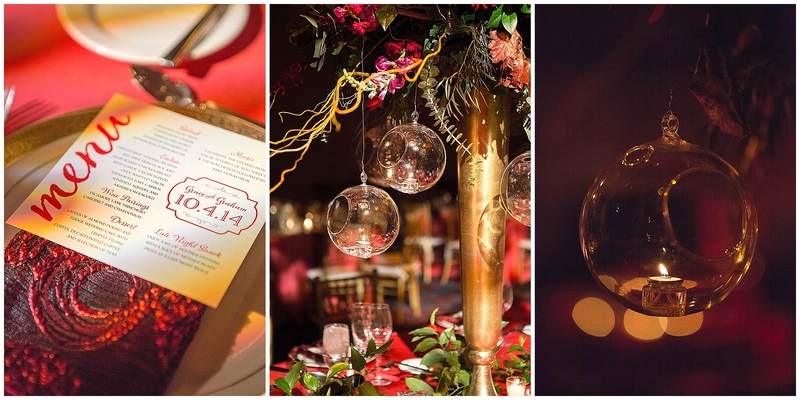 The details for this wedding were in the color palette. The flowers were magnificent. At the ceremony, through the altar piece, and the bridal party flowers, the guests got a hint of what was to come at the reception. 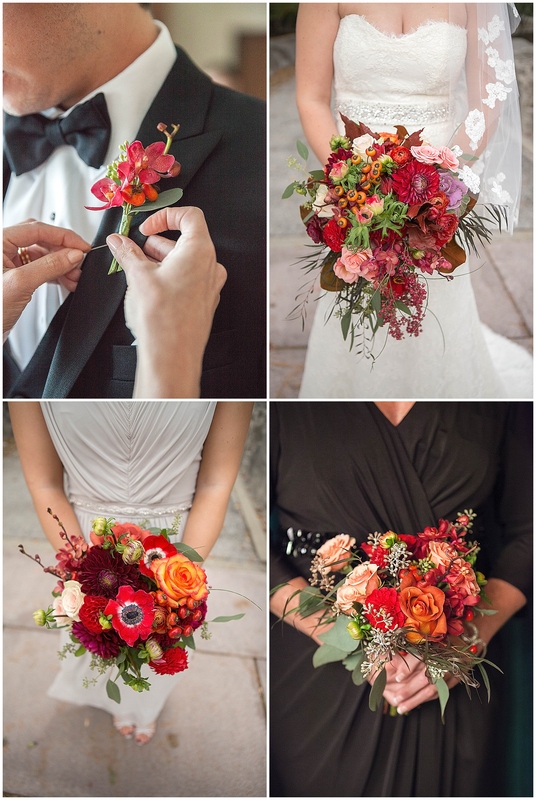 Not only were the colors vibrant and rich, but the choice of flowers daring and unique. (remember, no red roses for this bride — apparently, Grace isn’t a friend of the TV show “The Bachelor” — or so I’ve been told….) Instead, Grace received a cornucopia of floral including dahlia, orchids, anemones, berries, roses, coxcomb and even kale in her flowers. They were rich, opulent and textural! 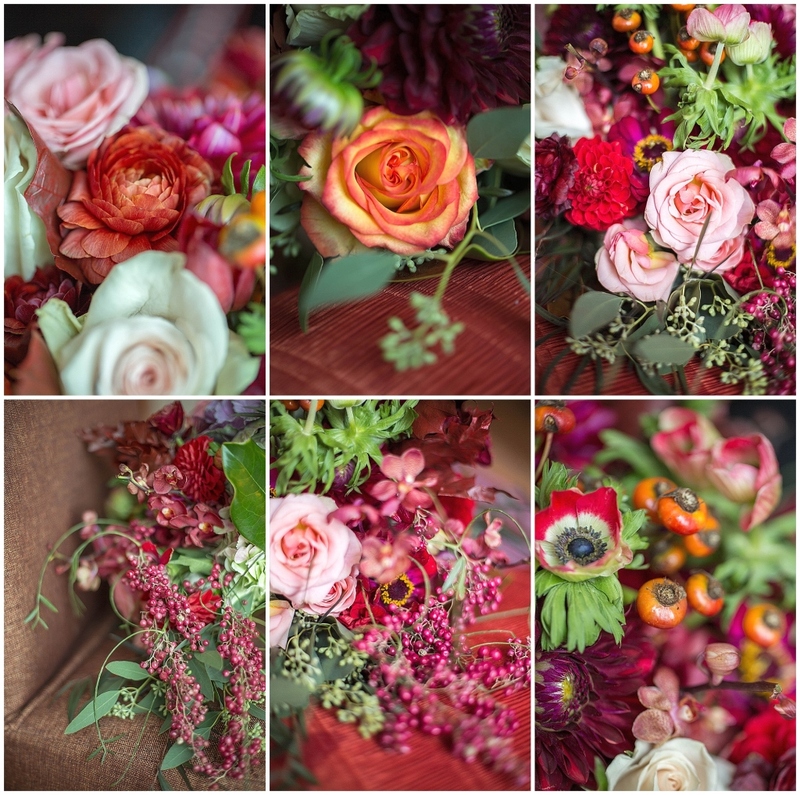 This shows the depth of color in JUST Grace’s bouquet! 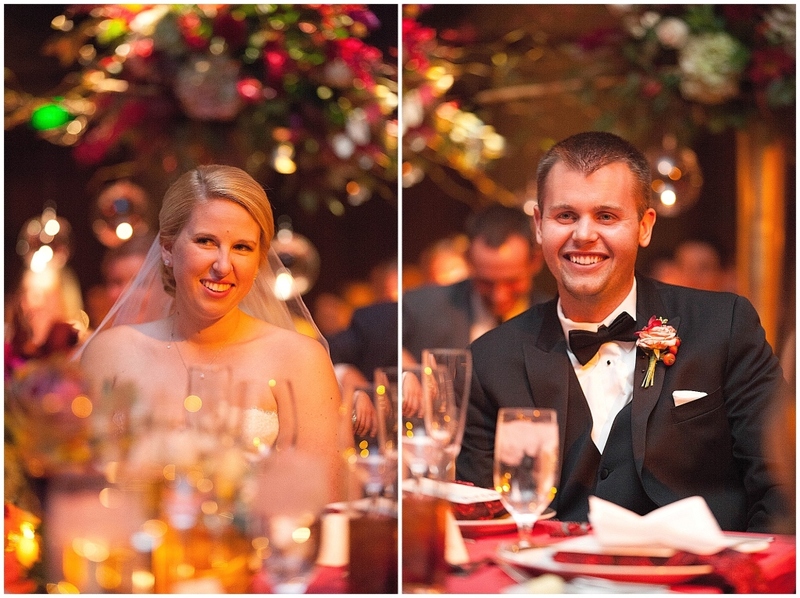 Wow – what a lucky girl — no red roses for this bride! The ballroom for the JW was lit in a golden almost haunting glow. Specialty lighting effects created an amber and pink aura that immediately drew the guests deep into the large ballroom. Shadows across the linens in various shades of orange, reds and pink created a warm autumn sunset for the guests as the entered the room for dinner. Guests took several minutes to be seated as they meandered the space taking in the details that lay before them. Long royal tables flanked the dancefloor, while intimate square and round tables mixed together in the space to create smaller eating groupings. 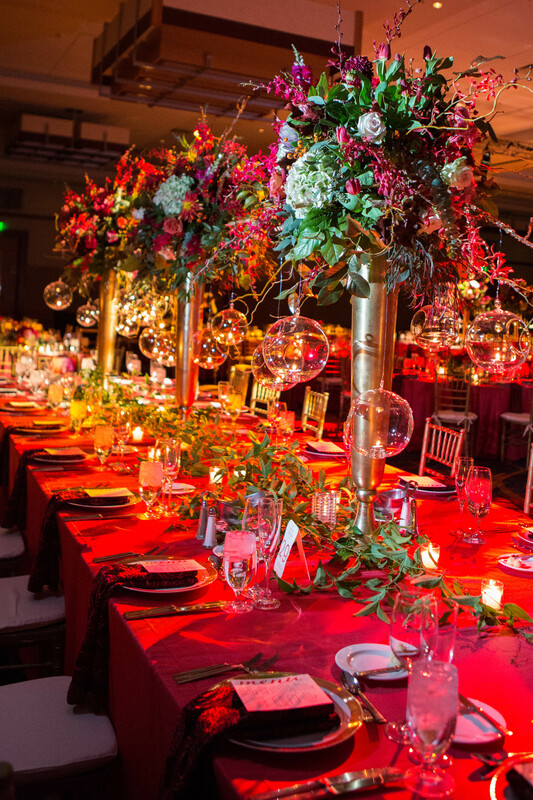 The large tables had massive centerpieces dripping with candles, creating height and impact in the large ballroom, while the round tables had lush, low centerpieces perfect for conversation. The room was very warm, rich and welcoming. It was more than Debbie and Grace could have imagined. It was a homecoming! 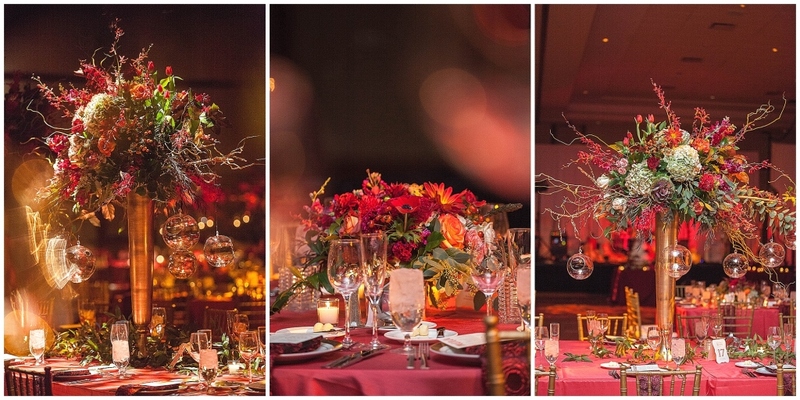 The ballroom was filled with family, friends and alumni and the Indiana traditions didn’t end with the color palette. Grace and Graham surprised their guests with a late night snack of Mother Bear’s Pizza, a groom’s cake (red velvet of course!) along with premiering the red cups at this time. The bar tenders also changed into IU T-shirts for the rest of the evening. This, along with the band, Rod Tuffcurls and the Benchpress, (a huge Bloomington staple) were perfect for this crowd. Following the band, they had a DJ to ensure the party went late into the evening! There was no stopping this fun dancing crowd! The dance floor was just as packed at midnight as it was at 9:30. It was an evening that was the perfect mix of formality and frivolity. In one evening we heard every genre of music from Pachebel’s Canon to Disney Frozen’s “Let it Go”! 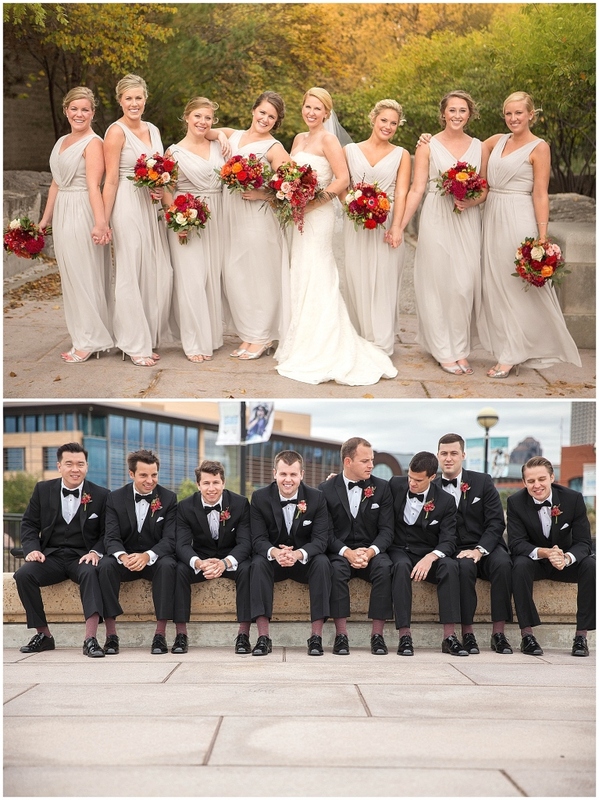 Grace and Graham wanted a wedding celebration that was truly a youthful, fun and energetic “party” while her parents wanted the formality and regal feeling befitting of a wedding. Together this was achieved. It was truly a “homecoming” – and isn’t that what the fall is all about? I thoroughly adored my time with these families. They are gracious, kind and welcoming, I was honored to work with them, and more honored to call them now, my lifelong friends.